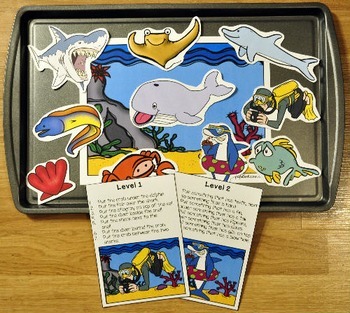 Ocean Adapted Book And Vocabulary Activities: "There Was a Weird Diver"
This Ocean Adapted Book and Vocabulary Activities, "There Was a Weird Diver," is a fun and silly ocean themed story that focuses on ocean themed vocabulary words, basic sequencing skills, and "Wh" questions. 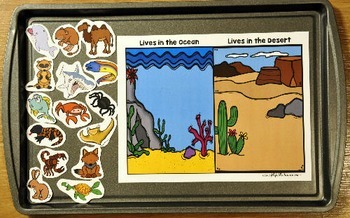 This download includes 1 adapted book, 1 sequencing stick activity, 1 sorting/classification activity, 1 positional concepts activity, and 1 set of vocabulary labeling cards. 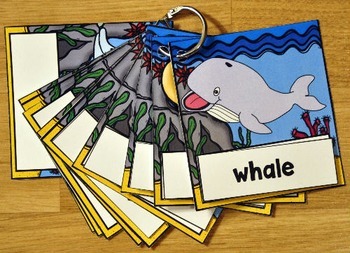 In a small group, a teacher or therapist reads the story as students follow along and match a word and picture to each page. 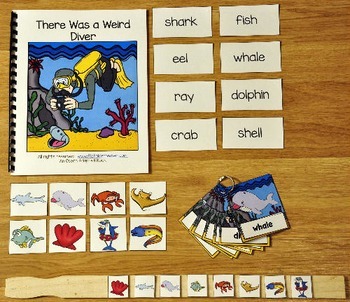 After the book is complete, the teacher or therapist can extend the activity to other areas of focus such as sequencing skills, visual discrimination/identification skills, positional concepts skills, and sorting and classification skills by using the included supplemental activities. Students working at an independent level may work through the activities in a work station or literacy center. "There was a Weird Diver who swallowed a shell. But I don't know why he swallowed a shell. There was a Weird Diver who swallowed a dolphin. That boy "went to coughin' " when he swallowed the dolphin. He swallowed the dolphin to shove the shell. But I don't know why he swallowed the shell.